If you live in a house, you're probably blessed with an entire closet that serves as the pantry area. Meanwhile, those of us who can barely fit a Christmas tree into our modest apartment without knocking things over typically have to stash our goods into wherever they'll fit. 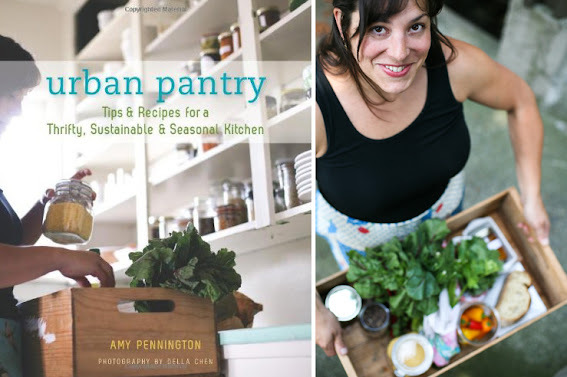 So I've reached out to Amy Pennington, a Seattle-based food writer, gardener, and author of Urban Pantry: Tips & Recipes for a Thrifty, Sustainable & Seasonal Kitchen, to show us urbanites how to maintain a pantry of our own, what to stock for entertaining last-minute guests, and how we can transition into the winter season. 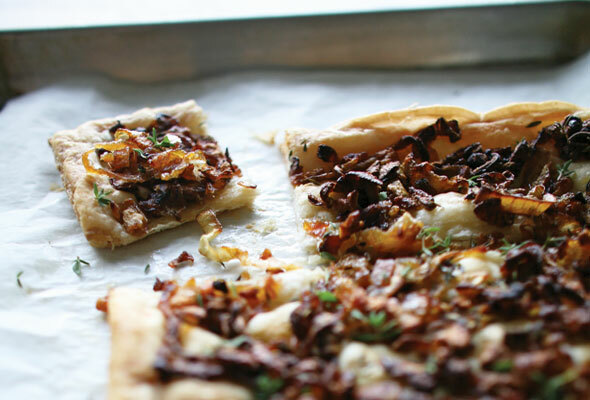 Don't miss her Onion-Thyme Tart recipe below! Hi Amy! As someone who lives in a small one-bedroom in the heart of Seattle, you know all too well how hard it is to stock a variety of foods in a city apartment. Could you just quickly explain what an "urban pantry" is? To me, an urban pantry is a small cupboard in which to keep food stuffs. Often, when you live in an urban environment, you are living on a bit of a small scale. My sister's suburban home has a huge food pantry and there is lots of room to store things. When you have a smaller place in the city, you're forced to be choosy and strategic about what you stock in your pantry. Do you have any quick or creative tips on making sure your products are always fresh? What products should we keep an eye on? I keep all of my grains, nuts, and dried fruits in air tight glass jars and also buy them in small quantities so they are not sitting around for months on end. You must store them in a cool space away from light, as well, otherwise you run the risk of spoilage due to temperature fluctuations. Storing nuts in your freezer is also a great idea, but my freezer is full of stocks, fruit, and other preserved items, so I often don't have space. What items should every host keep stocked in her pantry to entertain last-minute guests? Puff pastry is a definite. You can make dinner, an appetizer, or a dessert with one sheet of puff pastry. For an appetizer, you need only season with caramelized onions and salt for a killer nibble. For an entree, you can fill the dough with a savory cheese and some ground meat - sort of like a meat pie. For dessert, spread with a nut butter and thinly shaved apple and you have a tart. What are some creative ways to avoid waste in the kitchen? I save everything I have and make use of it straight away. For instance, the other day I made a recipe with stuffed chicken thighs and butchered the rest of the bird freezing the breasts and then immediately tossing the wings and carcass in a big pot to make stock. I didn't have plans for the stock, but I put it in my freezer and I'll have it for another quick meal soon. It is also important to be realistic about what you eat and what your schedule is. Avoid waste by not over purchasing, particularly fruits and vegetables which (if not stored properly) expire quickly. What are a few of your favorite non-food items that could really improve an impromptu get together? I'll assume that this excludes wine, too!? Nice linen napkins always dress a table, along with appetizer plates. I search for vintage linens and have about three sets of gorgeous linen napkins. (I hate paper napkins and plates - such a waste!) Great music is key. I like to mix it up and play Louis Armstrong alongside Grizzly Bear, Nina Simone with something a bit more esoteric like Andrew Bird. How should a pantry transition from season to season? Grains, nuts, and fruits can be stocked all year as they're already "preserved." The biggest transition happens with fresh fruit and vegetables. In the summer, I freeze a bunch of peaches and cherries for winter pies and smoothies, so in winter I transition to eating mostly fresh vegetables and fruit to frozen or canned. Also, winter ushers in new produce like tropical fruits and hardy brassicas - brussel sprouts, kale, and cabbage. I look forward to them every year. What are good items to stock up on during the winter? In the fresh pantry, I always have a few carrots, celery, onions and garlic - they are the cornerstone to so many different recipes. I also make sure to have about three pounds of butter on hand for impromptu baking. I leave a pound on the counter so I have pre-softened butter for cookies and batters and then some in the fridge so it's super cold for pie doughs and biscuits. It's also imperative to always have eggs and some form of dairy - milk, yogurt or buttermilk will come in handy more often than you think. The holiday season is the most wonderful time of the year! For me, gardens are done for the winter, so life slows down. It is darker earlier, especially in Seattle so it sort of forces everyone inside and I love that time to be elaborate in the kitchen. Last night I had friends over and had time to make meatballs and sauce and homemade focaccia because I got started so early. Because it is such a festive time of year, I'm inspired to really throw down in the kitchen and try intensive recipes like strudel - that is hard! Do you have any holiday-specific tips for this time of year? Stock your pantry! If you plan ahead, you spare yourself the last minute run around when stores and streets are certain to be busy. Also, don't get too ambitious. Cook what you know and try one or two new things at most. Spending time with friends and family is the most important thing, not standing in the kitchen for hours. Also, remember to hydrate! We often get so busy we forget to drink water, but it is seriously a miracle elixir and will fuel you through marathon days without looking haggard - that's my beauty trick for the season because you should always look great in the kitchen! complement to soup or salad or for an easy predinner nibble. continuously until softened (about 10 minutes). Sprinkle in the salt and continue stirring. caramelized onions from the heat and set aside. oven or toaster oven, but they’re just as delicious served at room temp. I barely have time to wipe my kitchen table off, let alone stock a pantry or freezer, or wash linen napkins. You two make me feel very lazy! The water tip, though? Love it. I try and try and never remember to drink enough during the days. You always find the most interesting people to interview! Oh don't feel bad or overwhelmed! Hopefully you gleaned at least one little thing that you could try in the future. Oh, I just loved this post -- and Amy's innovative way to hang pasta! I think her book is going to be my next purchase.